Kiyomizu-dera was constructed on Mt. Kiyomizu (Mt. Otowa). The main temple at Kiyomizu-dera, which is also referred to as the “Kiyomizu-dera stage,” was rebuilt by Tokugawa Iemitsu in 1633. The main temple building, constructed early in the Edo period, is a National Treasure. It is supported by more than 100 keyaki (Japanese Zelkova) trees and not a single nail is used. Jojuin, in the northern area of the temple grounds, features the Moon Garden, which is a borrowed-scenery garden that has been designated a National Place of Scenic Beauty. The garden lanterns, eboshi stones, and the contrast with the pond in this pleasure garden are beautiful. Illumination events are sometimes held at night. Spring water gushes out from Mt. Kiyomizu (Mt. Otowa) along the side past the main temple. This is known as the Otowa Waterfall, and it is the origin of the name Kiyomizu-dera (which means “clear water temple”). This water is said to bring good luck, so tourists can always be seen lining up to take a drink. The spring water, which is available for purchase, is also said to bestow a long life. Tourists are often seen putting their hands together in prayer for safe childbirth at Koyasu Pagoda, which is an Important Cultural Property, and at the statue of Daikokuten on the west side of the main temple, which is said to bring good luck. Jishu-jinja, a shrine to finding love that adjoins Kiyomizu-dera, is a popular tourist attraction with two guardian stones. It is said that if you can walk from one stone to the other with your eyes closed, you will find love. Jishu-jinja is a very popular tourist attraction with young people and couples. Kiyomizu-dera has many highlights, such as the main temple building, which is a National Treasure, and other buildings that are Important Cultural Properties. Events are also held throughout the year. 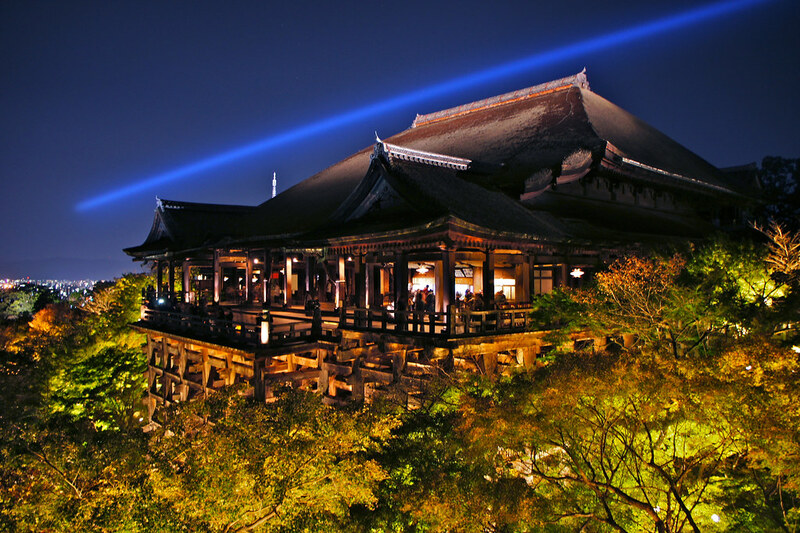 Kiyomizu-dera is open at night from spring through fall. The famous Seiryu-e event is also held, which is based on a story about a dragon (an incarnation of the goddess Kannon) that comes to drink the waters at Otowa. Many tourists come to this event, where the dragon can be seen parading around the temple grounds. Approximately 30 stores line the Kiyomisu-zaka road that leads up to Kiyomizu-dera. They sell souvenirs from Kyoto, such as Japanese sweets that are unique to Kyoto, Japanese tea, and folding fans. After visiting Kiyomizu-dera, it’s fun to take a stroll through Kiyomizu-zaka. There are 5 famous temples in Kyoto which have been ranked as the Kyoto Gozan or the Five Great Zen Temples of Kyoto, of which one is Tofuku-ji Temple. As well, the buildings of the temple show characteristics that belie its status as a Rinzai sect temple. The 22-meter high sanmon gate has been designated as a National Treasure and is known as the oldest sanmon gate in Japan. Also, Tokufu-ji has the oldest zen meditation hall in the nation. Furthermore, Tsutenkyo Bridge which makes use of a steep valley and links the chief priest’s quarters (hojo) and Kaisan-do Hall is an especially well-known structure within the temple. Tofuku-ji is called “garan zura”. A garan refers to the temple and its important buildings, and with Tofuku-ji, buildings such as the main hall and the chief priest’s quarters make up the core of the garan with Ryogin-an and Reiun-in Temples comprising some of the 25 sub-temples on the grounds. It’s good to take a look around at the National Treasure sanmon gate and Important Cultural Properties such as the zen meditation hall, the 13-storey pagoda and the reception hall. In addition, there is the unique dry landscape rock garden made from red sand as well as similar gardens for Reiun-in and Taiko-an Temples. There are plenty of sights to see among the 25 sub-temples and other facilities that fully complete Tofuku-ji’s reputation as a famous tourist spot. Tofuku-ji is famous as a garan zura, but its gardens also claim great fame. The northern garden at the hojo is known for its unique pattern and beautiful harmony of moss and paving stones. This was the work of Mirei Shigemori who earned great popularity during the Showa Era. Also, Tofuku-ji is well known as a site for the autumn colors. Kyoto has many famous places for fall foliage, but it’s no exaggeration to say that this temple is the most beautiful and highly popular of them all. Calledtsutenkoyo (fall colors going up to the sky), the leaves have the special characteristic of turning into a deep yellow. In particular, the leaves seen from Tsutenkyo Bridge overlooking the steep valley are incredibly beautiful, and in autumn, many tourists gather to take a look. Within the temple grounds, there are about 2000 maple trees whose leaves are famously split into three lobes. Meanwhile at the hojo, there is a place that resembles a protruding balcony where you can see the fall colors and Tsutenkyo Bridge which makes it the perfect sightseeing spot during the fall season. Following the passing of Hideyoshi Toyotomi, his widow, Nene, under her title of Kita-no-Mandokoro, established the temple in 1606 to hold his memorial service, so it is also known as Nene’s temple. The person who took over authority after Hideyoshi’s death, Ieyasu Tokugawa, also provided great financial assistance after political consideration, and the temple took on an exceedingly magnificent appearance. The two ponds that center the garden, Garyo-chi and Engetsu-chi, have basically retained their appearance since the temple’s founding about 400 years ago, and there is a spread of the beautiful scenery using the mountains of Higashiyama. You can enjoy the beautiful fall colors and the leaves are illuminated in the evening. The leaves are splendidly reflected like a mirror from the pond, and you can enjoy the wondrous garden scenery. Unlike the main garden, the Hojo (Chief Abbot) front garden has white sand spread all over in front of the Chokushi-mon gate, which was used as access for envoys from the Imperial court. In spring, you can see some wonderful weeping cherry trees. There are also two interesting bridges within the grounds. Kangetsudai, which has been designated as an Important Cultural Property, is a small structure that connects the shoin drawing room between the ponds and the Kaisan-do commemorative hall as a roofed corridor. As its name in Japanese would suggest, it was built as a structure to enjoy viewing the moon at night. There is also another roofed passageway connecting Kaisan-do and the mountaintop Otamaya mausoleum called Garyurou which stretches toward the mountain and has been likened to a dragon rising toward Heaven. Kodai-ji’s biggest highlight, Otamaya, has been called the pinnacle of lacquerwork art during the Momoyama Era, and within the space decorated in black lacquer and gold dust, wooden statues of Hideyoshi and Nene are enshrined there. A museum of art has also been established within the grounds, and 230 items related to Nene and lacquerware products are exhibited. Higashiyama-ku is one of Kyoto’s most popular tourist destinations. It is a hub of historical buildings, including Kiyomizudera, Ginkakuji, and Yasakajinja. Even among them, Sanjusangen-do is a popular destination for tourists that was given three stars in the Michelin guide. The sitting statue of Senju Kannon, which is the principal object of worship in Sanjusangen-do, is enshrined in the Buddhist temple. The statue, which is made of wood, is a designated National Treasure. On both sides of the sitting statue of Senju Kannon are Buddhist altars shaped like stairs, which are adorned with 1000 life-size wooden statues of the 1000-armed Senju Kannon. One more statue is located behind the enshrined sitting statue of Senju Kannon, making a total of 1001 life-sized statues of Senju Kannon, all of which are designated as Important Cultural Properties. Although Sanjusangen-do is known for the sitting statue of Senju Kannon and the 1001 life-sized statues of the 1000-armed Kannon, there are other National Treasures and Important Cultural Properties that are not be missed. Statues of the God of Wind and the God of Lightning are featured on the left and the right as you enter the temple. These statues are unique, as the God of Wind holds a bag that contains the wind, and the God of Lightning holds a drum that releases lightning. In front of the statue of Senju Kannon are 28 wooden sculptures known as Nijuhachi-bushu, which are the guardian deities that protect those who believe in Senju Kannon. The 28 statues each have different facial expressions and gestures, and their roles as deities differ too. The main temple building, the sitting statue of Senju Kannon, the statues of the Gods of Wind and Lightning, and the 28 wooden statues are all designated National Treasures. The powerful wooden statues, which look like they could come alive at any minute, are the real highlight. Sanjusangen-do is like a museum of Buddhist statues where you can take a leisurely tour of the historical Kamakura period building and the Buddhist statues. There are a number of teahouses in the park along with a shop selling a Kyoto delicacy just a bit off the main path. It is Hiranoya Honke which sells the famous imabou. Imabou is a famous example of Kyoto cuisine in which shrimp-shaped taro potatoes known as ebi-imo are cooked together with dried Pacific cod. The peeled potatoes and the dried cod softened over a week are stewed for an entire day. This unique way of cooking is called fuufu taki which has been passed down over the generations for 300 years. You can really taste the characteristic savory and sweet flavors of the ingredients.